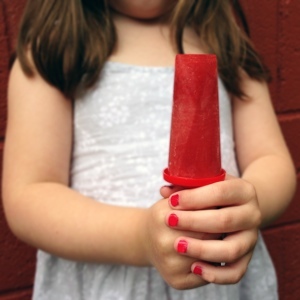 In addition to making watermelon candy, one of my favorite ways to extend our summertime fruit is to make “watermelon on a stick” — watermelon popsicles. And of course, this treat can be made with just about any fruit — like these pineapple-banana freezer pops! Makes 6 to 8 small popsicles, depending on how juicy your watermelon is. Pulse a few times until liquid is free of chunks. Pour into freezer molds for yummy goodness and store in the freezer. Quickly dip in lukewarm water to pop the cubes easily out of the molds when you’re ready to eat them.